1-3 lights @ $19.95 ea. 4-9 lights @ $17.95 ea. 10 or more lights @ $16.95 ea. Nite Guard Solar® provides a safe, solar-powered flash of danger which recreates the deep fear of being watched and repels all night predators. Losing poultry to night predators, whether the poultry are free-range, in a coop, or with a chicken tractor, will end, when using this highly effective product. Automatically turns on at dusk and off at full daylight. 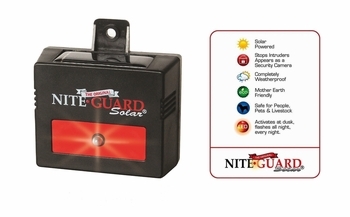 It is completely weatherproof, solar powered and will last an average of 3 years. Multiple units required for 360-degree protection. Q: What’s the best way to place the lights for use against flight predators like owls? A: For owls, we recommend that you purchase 4 lights and place them on a single post located near the center of the area to be protected. In a large area (several acres), you may need two or more clusters of four lights. Put the lights 10-14 feet high on the post with each light facing a different direction. This will ensure your entire area will be covered. The lights can be seen up to a 1/2 mile in the direction they are facing. If you are not located on flat ground, you will need to adjust the height of the lights on the post. If located on a hill, adjust the lights lower, as the owls may be coming from below the area to be protected. If located in a valley adjust the lights higher as the owls may be coming from above. For use with Purple Martin houses, mount the lights directly to the house itself or one foot above the house on the same post, or put the lights on a separate post and place the post nearby the house. For use with guineas or gamefowl which run loose, you may need to place the lights higher than 14 feet; put the lights at the same level as the birds are roosting. Q: What’s the best way to place the lights for use against small ground predators? A: For predators like raccoons, opossum, skunk, and all other small ground predators, put the lights approximately 25-50 feet apart, around all four sides (perimeter mount) and eye level to the predator, approximately 10-15 inches off the ground. Also, if the area to be protected is not located on flat ground, you will need to adjust the height of the lights as well. For example, if located on a hill, adjust the lights lower or if located in a valley, adjust the lights higher. Approximate eye level to the predator is the key. Use cluster mount for large, open acreage. Q: What’s the best way to place the lights for use against large ground predators? 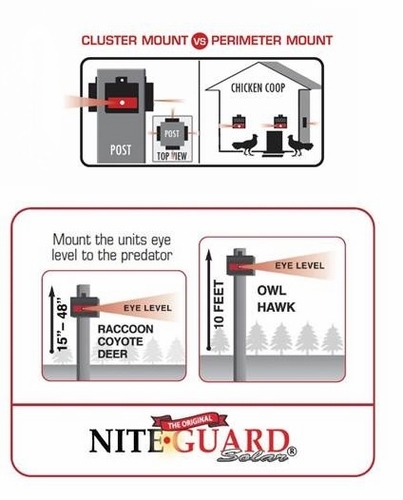 A: For predators like fox, coyote, bobcat, wild boar, mountain lion, wolf, bear and all other large ground predators, put the lights approximately 100-200 feet apart, around all four sides (perimeter mount) and eye level to the predator, approximately 20-30 inches off the ground. Also, if the area to be protected is not located on flat ground, you will need to adjust the height of the lights as well. For example, if located on a hill, adjust the lights lower or if located in a valley, adjust the lights higher. Approximate eye level to the predator is the key. Use cluster mount for large, open acreage. Remember to always flash the light AWAY from the area you are trying to protect.